Apple Pay Cash is the most talked about feature that Apple has added to its new major update i.e. iOS 11.2. In the last article, we saw how to set up Apple Pay Cash to your Wallet. Now that the card is added, we now proceed to see how we can send and receive money using Apple Pay Cash. You must be residing in the US and be at least 18 years of age. A compatible device that has iOS 11.2 or later and watch OS 4.2 or later. Sign in with your existing Apple ID on both iCloud and iMessage from the device you are using. Have money in your Apple Pay Cash card or other added cards. Agree to all the Terms and Conditions. If you are doing it for the first time, open any conversation in Messages. Now tap on and then . You may also need to verify your identity. Once you have fulfilled all the prerequisites, you can then send and receive money using Apple Pay Cash. Open Messages and then open a new conversation or select any existing conversation. Post this, use the + or – sign to increase or decrease the amount. If you wish to enter the exact amount on your own select Show keypad. After entering the amount, select Pay. Here, you can also write any message if you wish to send with the money. Finally confirm the payment with either Face ID, Touch ID, or your passcode and then send it. Open Messages and from there open an existing conversation or start a new conversation. Now scroll down and locate , tap on it. Now turn the Digital Crown to choose the amount to pay. If you wish to enter exact amount, select the Dollar amount. Now tap after the decimal and lastly turn the Digital Crown to enter the amount. Now tap Pay. You can also review or cancel the payment information by scrolling down. By default, Apple pay Cash is used first to make any payments. Lastly, double click the side button to send money. If you do not want to perform any kind of steps to send money, Siri is there to help. Simply Ask Siri to “Pay 30 $ to Rita for the dinner” or whatever the payment is for. 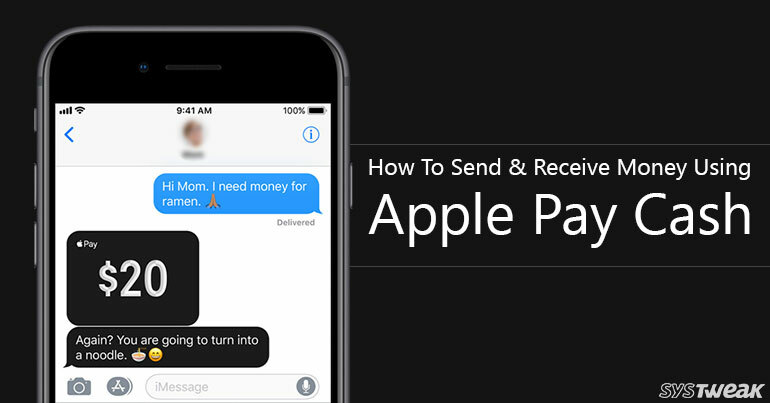 As seen above, sending payments to friends and family using Apple Pay is an extremely easy task. Likewise, receiving/requesting money using Apple pay is also an easy task. Request payment from other person and they can simply tap Pay, edit and confirm the amount and send. That’s it! Let’s look at how we can request a payment. Now select and then select . Choose the amount you have to request and then select Request. Here you can also add a message with the requested amount. Finally tap on to send the request. You can also have Siri do your work. Tell Siri to message your family or friend requesting money or to go to Messages app. Now say something like, “Request Anna 25$ for the movie ticket”. This will send Anna a message requesting to pay the amount. To send you the money, she can simply tap on the dollar amount present in the message. All the amount that you receive is saved in Apple Pay Cash by default. While using Apple Pay Cash for the first time, you will get a maximum of 7 days to accept the money received. Next time on, when all the terms and conditions have been accepted, all the payments will be accepted automatically in Apple Pay Cash. Wasn’t it an easy task? Using Apple Pay Cash you can easily send and request/receive money from your family and friends.